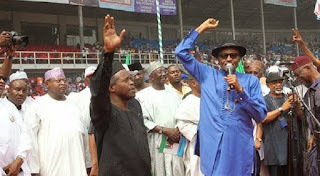 The Presidency has said that President Muhammadu Buhari and his deputy, Yemi Osinbajo, care less about reelection. The Senior Special Assistant to the President on Social Investment Programmes, Ismaeel Ahmed, said this at the weekend while briefing State House reporters on the achievements of the SIP. Ahmed; who addressed journalists alongside the Special Adviser to the President on SIP, Mrs Maryam Uwais; emphasized that Buhari and Osinbajo were committed to serving Nigerians and concerned more about them. The presidential aide, however, stated that if the president and the vice president had to campaign for a reelection, they had a lot of success stories to tell. This is even as Uwais disclosed that 80 million Nigerians were poor based on the estimate from the World Poverty Clock. Asked what the administration would leverage on as one of the biggest successes of the SIP for 2019 election campaigns, Ahmed responded, "I think even though this is a political promise, it came from a manifesto of a political party. “The implementation is far from being just political, the implementation is for all Nigerians. When we set out and were campaigning in 2015, we didn’t say what we're going to do is going to be solely for political reasons. "The president and vice president are more committed to the electorate rather than elections and are concerned about the future rather than just next one year. “So, this is entirely about the country itself and not just for political reasons. But, if you're talking about what we can leverage on, there are a lot of successes in SIP. “We're engaging 73,000 cooks that are growing rural economy. They're buying from local farmers. Therefore, this is growing the rural economy. “They're feeding some 7 point something million children and we've reduced the number of out-of-school children in the last one or two years we've been implementing the school feeding programme and engaging 200,000 young unemployed graduates that are receiving N30,000 a month. "Those are successes in it. So, if we're looking for things to leverage on, stomp our chests and storm the political campaigns and say we should be voted again, we have a lot of success stories to tell, but that is not the entirety and essence of this programme. The essence of this programme is to reduce poverty and to distribute wealth as much as we can. The president and the vice president care less about the elections, like I said they care more about the citizens."